Last week my dad brought home a baby bird that was hopping around the yard at work’s satellite facility baiting black snakes. 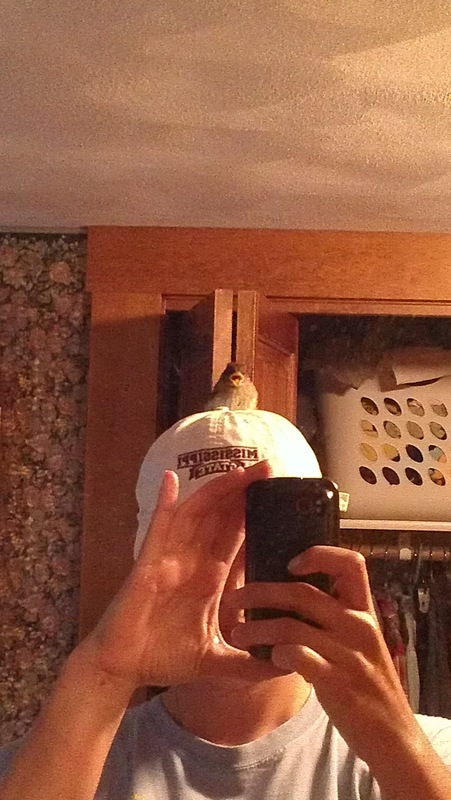 He couldn’t find a momma or a nest, so he brought her to my mom. This is not the first time that we have had a baby bird; in fact we actually have raised up kittens, mice, opossums, turtles, whatever needs a mother’s love for whatever reason throughout my entire life. So, dad brings mom this bird, we google her type and what to feed her. Mom and dad left and I sat for twenty minutes trying to feed her moistened high protein dog food with tweezers unsuccessfully. An hour after mom got back from lunch the little gal had a paper towel nest and was chilling out inside my mom’s shirt. I know, I know, weird. She was happy and eating though, so it worked. As a result of her love of my mom she has warmed up to people completely. She will now fly over and land on your head demanding food whenever you walk into the room.